We are living in a world where technology is advancing very fast, doing businesses to invest money and efforts into developing intelligent software to automate their operations and ensure that everything runs smoothly. “Quality at Speed” is a new quality standard which makes software developers use their highest skills to offer creative execution and reporting. Automation testing plays a crucial role in development operations toolchain as it helps software developers successful install and test artificial intelligence. However, a powerful automation testing cannot be done without some high-generation tools. They help developers determine how to perform automation and better deliver its benefits successfully. 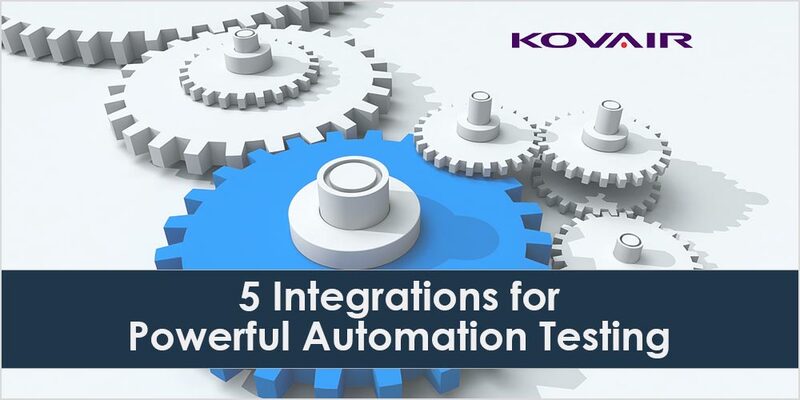 Thus, this article is going to show you which are the top 5 integrations you can use for powerful automation testing, also presenting their best features and benefits. When we think of automation testing, Selenium is the first tool that comes in mind. Studies have shown that nine out of ten developers have tried this tool. Why is Selenium so popular? The tool is extremely flexible. It is quite unusual to see such flexibility in an automation tool. Practically users can write their scripts in a variety of language. For example, they can use Java, Python, PHP, Ruby, or Perl, and be able to run this tool with them”. Moreover, Selenium is perfectly compatible with various system environments and browsers. Therefore, you won’t have any limitations if you use Windows, Mac, or Linux, as well as Chrome, Firefox, or Internet Explorer. On the other hand, RFT comes with a unique feature, “storyboard testing.” Developers can use it to edit tests without too many complications. Natural language and applications screenshots are enough to use storyboard testing successfully. In addition, as it is a tool developed by IBM, Rational Functional Tester can also be used together with other lifecycle management tools designed by the same company. IBM Rational Team Concert and IBM Rational Quality Manager are just some examples of tools which can be used in combination with RFT. Katalon Studio proudly occupies the second place in the testers’ preferences, offering a complete set of features for Web, API, and Mobile. 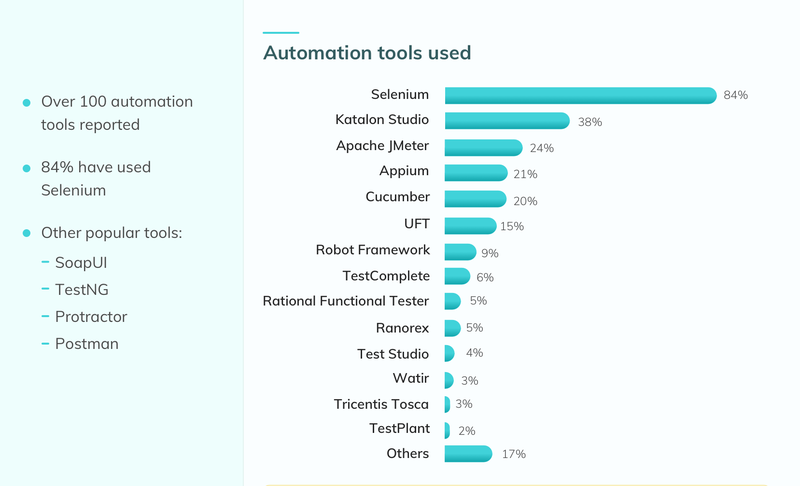 In comparison to Selenium, Katalon Studio makes it easier for the users to start the automation testing and requires less expertise and time invested from their side to run the tests successfully. It doesn’t need any programming skills as it has been developed for advanced test scripts. It doesn’t have any licensing or maintenance fees. You can still pay dedicated support services if needed. Being built on top of Selenium framework, its developers managed to eliminate the requirement for advanced programming skills, being easily integrated and tested. On the other hand, Katalon Studio doesn’t offer too many choices when it comes to scripting languages. It only supports Java and Groovy which can be seen as a drawback for some testers. However, the feature set keeps evolving which might bring some pleasant surprises for the users in the future. Proudly occupying a place in the top 10 preferences in the users’ preferences for automation testing tools, UFT can be used for testing for mobile, Web, and desktop applications. It also includes a comprehensive set of features for a successful API testing. Also, it is easy to use UFT for the smart object and image-based object detection together with correction. Users have been impressed by this tool’s intuitiveness when it comes to the creation, execution, and reporting of API tests. With UFT it is also easier to generate API tests from WADL documents, this being a feature much appreciated by many testers. Finally, each test action, activity, and parameters can be visualized and monitored with diagrams. It only requires basic programming skills, bringing the advantage of an integrated user support system and a rich and active community of users. However, it is a costly solution, with license and maintenance fees reaching to more than $3000. On the other hand, it supports VBScript exclusively. Therefore, no programming skills are required for it. Another reason why testers prefer this tool is because it comes with various scripting languages: Java, C++, and C#, VBScript, Delphi, or JScript. On the other hand, it requires serious licensing and maintenance fees. The starting fees are around $2300. What is more, any extra modules and add-ons will also bring more costs for the testers. In conclusion, automation testing is necessary, and developers are extremely aware of its importance. Since there is no universal integration to satisfy all the market’s needs, testers should carefully evaluate each application’s pros and cons before they jump into using it. The programming languages and technologies evolve very fast these days, which makes cost a significant factor in choosing one tool over the other. Previous Post:The Business Dilemma of Machine Learning: Should you go the route of Self-Taught Machines? Next Post:Are Tools Integration Challenges Affecting Your DevOps Process?